Cars. Not really my favourite subject. For whatever reason I’ve just never really got the bug. I love my gadgets and tech toys and I guess thankfully for my bank account, that love has never transferred to cars. Maybe it’s the fact that it sits in the street devaluing daily and at some point after buying a car some git will hit it with a door, or scratch it lightly as they pass by in a car park. Odd viewpoint I know, but it’s not changed in 14 years of driving and owning cars. However, I did need to replace my Focus. It was 9 years old, I’d fell out of love with it a while ago and in my head I had to replace it. This wasn’t helped by a few fresh scratches from work recently that I hadn’t bothered fixing and a couple of bad pothole problems this year. Yes I would have got that no matter what car I had, but it still lead me to replacing sooner rather than later. But replace with what? 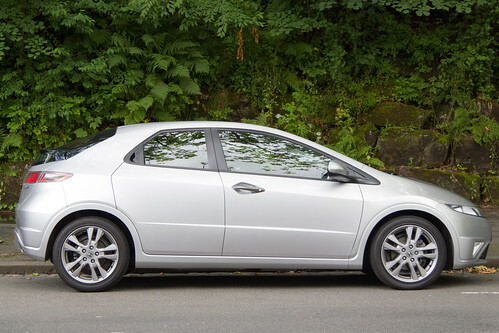 A Honda Civic. 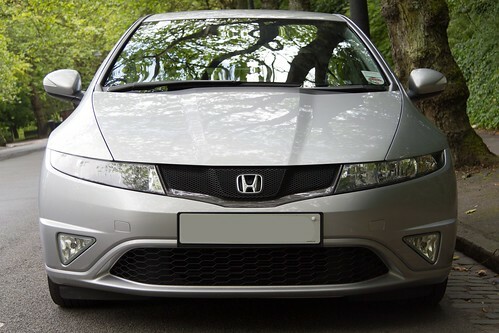 It’s just over a year old so still has 20 months left on it’s warranty and it’s a 1.8 SI petrol edition. I love the interior – the dash is colourful and clear and there’s lots of nice little features inside that tick the boxes for me. It’s comfortable to drive and has plenty power to keep me happy. I also like the exterior styling – I know it’s not to everyone’s taste which is similar to the Focus in that amongst my friends they either loved it or hated it. Obviously I love it! I bought the car from a garage in Edinburgh so the first actual drive back was interesting – torrential rain and the joys of the M8 but it was a pleasure compared to the Focus on the way through, but then it should be given the age difference. The ride is slightly harder than the Focus but the steering is more direct. There’s also some gamifaction on the dashboard – an eco rating to tell you how you are driving and when to change gears to optimise fuel usage. Overall I’m delighted with it although I have only had it a few days now. Hopefully it lasts as well as the Focus did. One last geeky point that I like – it has a USB port and I can plug in the iPhone, and control navigation of the iPhone from the steering wheel. It’s the small things. Bliss. Good choice, I do miss my Civic, seriously considering getting another, the fold up back seats are genius. Does yours have the glass roof? Back seats are amazing – brought a grin to the face when I first saw them. No glass roof though – not keen on them on any car. One of us. One of us…. Seriously, don’t think you’ll be disappointed. Rather jealous that I’ve got the older shape, but I’m really happy with mine.